I am sure you know that I am a fan of Ben Bernanke if you have followed our investment blog. But as Ben retires from the FED chairman post, a new hero in Wallstreet emerged. or maybe heroine :). It seems that Ben has trained and taught Yellen a trick or two how to motivate the Wallstreet guys, charm them into believing in the "Accommodative monetary policy" dream. She says in yesterday Senate hearing that " it was difficult to tell how much of the recent decline in U.S. economic growth was due to weather, adding the central bank might consider a pause in its reduction of bond buying if the weakness persists." Surely, we all know that winter is a seasonal effect and most likely it will be over in the next 2 months. Will the economy really cripple because of this cold winter? Does Yellen need to really stop the tapering just for these 2 months, so that US unemployment rate really heads for 2%? I don't think "weather" is the point. She is just a stock market manipulator! Ha, I thought Bernanke is good with words, but Janet Yellen seems better! She uses the weapon of accommodative monetary policy everytime she appears to talk. And it is because of this fact that we predicted Dow will bounce back from its deep drop in January. Those who have followed us have known that we predicted this quarter DOW and S&P500 will still hit historical high! And we think this run will continue after the historical high. Indeed yesterday S&P500 close at a new historical high with a Yellen knockout verdict! It is DOW turn of making history again in the next few days. It is unimaginable now to think how high the DOW will go! I know everybody is worried. But I feel that with such loose words about the monetary policy, this bullish run can't seem to stop! Imagine if there are 2 months where DOW drop another 1500 points and the unemployment rate increases. I am sure Yellen will not hesitate to put a stop to the QE tapering! The market will bounce back hard then. And who knows, there is even chance that the printing of money might even increase $10billion if the situation get worse. So my take for us now is to get in the game whenever DOW drop 10% from the top. This seems an unstoppable bullet train now. Especially for the first half of 2014! US Stock Tip: Facebook runs like a bullet train! But how now? If you have been reading our blog or hear me in media, you would have known that I have been talking profusely about Facebook being a retirement portfolio stock! Articles where I posted on Facebook and my reasons why you should buy whenever it drops! I have been asking people to buy this stock when it was $35. Within a short period of 6 months, it has doubled itself to $70! On Monday, it reached $71 highest. In this great 5 years bull run, seldom would I recommend a stock to hold long term! Reason is I don't think there are many stocks left tat may double or triple in price in the next few years! BUT Facebook is my pick to double, triple or even quadruple its price from now in the long term! Any time it drops 10-15%. it is BUY BUY BUY! People ask me about twitter compared to facebook. I know that Twitter did make a good run too this year, but, it is definitely not in the same world of facebook! It has no earnings and plan how to monetize its business yet. I basically cant see the revenue model growing to be like the next google or apple. I do predict that Facebook will have a disappointing quarterly earnings next season! We do predict a gap down on the next earnings, and rest assure that I will be catching this stock once it gaps down! It is angbao drop from sky! Just Before next earnings, it will be overpriced. Long term it is still underpriced to me! If you can withstand the gap down, hold on for 10 years is my advice! We got this stock right again! In the article dated 14th Feb, we mentioned that Utd Envirotech has done well like what we predicted, going from $0.80 plus cents to $1.25. But we warned that $1.30 is still a resistance. After touching $1.29 recently, it drops for a few days. Today it stands at $1.23. It is not easy to make a good judgment to buy a stock! And it is more difficult to predict the point to sell a good stock that is running like crazy! 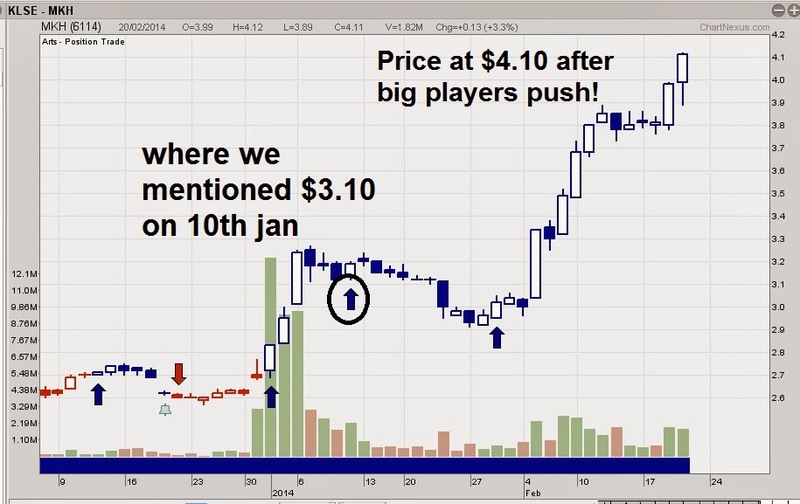 We have predicted there be a consolidation at $1.30! We are off by 1 cent for this case. It stop at $1.29! This method that we used consistently to predict the price where stock run halts is what I called "Law of Gravity of Price". Where we think this stock might be now? 2) If it breaks down $1.20 within 1 month, this stock is heading for $1.10 at least, a good point to pick up the stock would be between $1.05-$1.10! Recently we have identified Big players scooping up this stock MKH on 10th January. When we held a seminar in KL, Cititel, we asked everybody to take note of this stock. 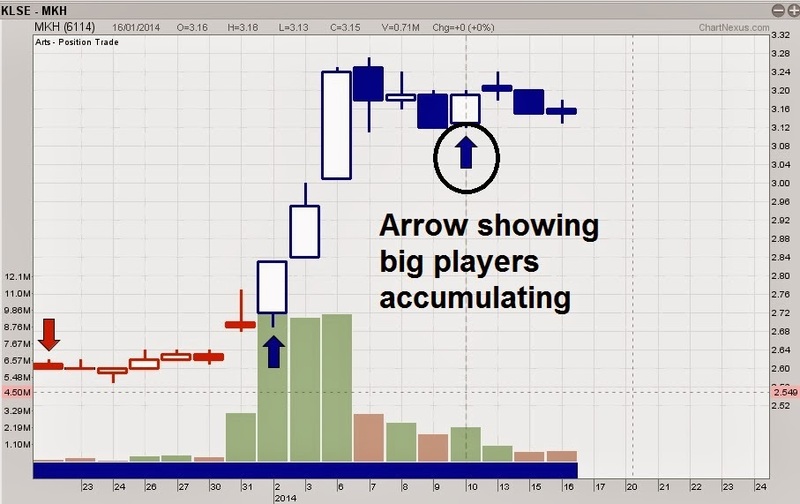 Check out this cropped out chart on 10th January where we issued the buy call! MKH was $3.10 then. This is the price of MKH now, $4.10 within a period of one month! Do you wish to know the next malaysia stock that we are watching now that may run like MKH and DSonic? Come for our seminar this weekend to find out! Seats are limited!! 100 seats, Left 25 seats only! We are proud as well as fortunate to say we have correctly predicted the turnaround again! A good start to the year! Hope you followed on our call! A few weeks ago, people were screaming at a stock collapse in 2014. Emerging market is finished. I think some of these friends are now caught by this sudden turnaround. 1) Do you remember that we mentioned that we are looking at DOW to rebound at the 200 day MA? That is also the day the bottom comes! 2) In an article on 28th Jan, we mentioned that Hang Seng is set for a rebound 21500-22000. When it drops to lowest 21200, we tell our radio audience to buy Hang Seng and I am looking at HK stocks now! Today Hang Seng is at 22536. In the same article, we urged everybody to buy Shanghai Composite at 2000. Now Shanghai Composite is 2135. It is barely 2 weeks since we last say it. 3) In another article dated 3 Jan, we mentioned to buy gold at $1200 and set our target at $1320. One and a half month has past and now gold is $1329, reaching our target! 4) We also mentioned to buy KLCI when it is below 1800. Now KLCI is hovering above 1800 at around 1820. 5) In another article we mentioned to buy Aussie dollars when it is below 0.8800. 6) And lastly talking about the STI, I mentioned in radio 958FM that STI should turn around at 3000. At most give it another 50 points, at 2950 is really CNY Ang Bao! Now STI has reached 3069! Not much, but I am sure quite a bit of turnaround having ran 100 points in 2 short weeks! So far this year, we fortunate in our predictions again. A good start to the year! Hope you earned a BIG CNY ang bao along with us! Do come for our preview seminars where we will give you our forward guidance again! 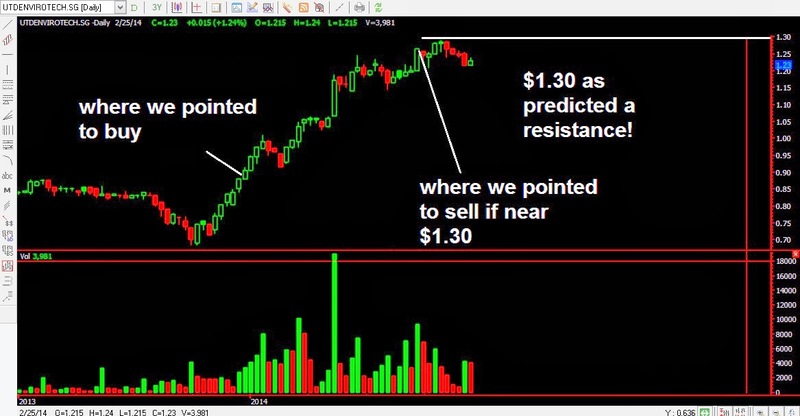 Remember that there is always a method to predict turnarounds. Look at our other posts to find the seminar dates. How our graduate makes US$226,425.75 Profits in 6 months last year? It is always a joy to see my graduates make money consistently in the investment market! Ever since I started teaching this secret of making money, a lot of our graduates have benefited from it. Last week, we have a graduates gathering sharing session where a few graduates presented their portfolio and results. This is Cindy's portfolio for the whole year 2013. This is Cindy sharing with the class how she compounded her wealth starting with US$60,000 to make US$226,425.75 profits! Last week I showed a full house packed with people how I managed to grow my 2013 account 8 times in 1 year! After years being in the investment business, I truly believe that only the minority makes money from the stock market. There are ways and methods to know how to be this minority and it would probably take 3 hours to share with you my method. Learn about the SECRETS of the Investment Market! In the session, you shall see Daniel Loh <2013 investment portfolio> how he grow his account 800% across the months!! !